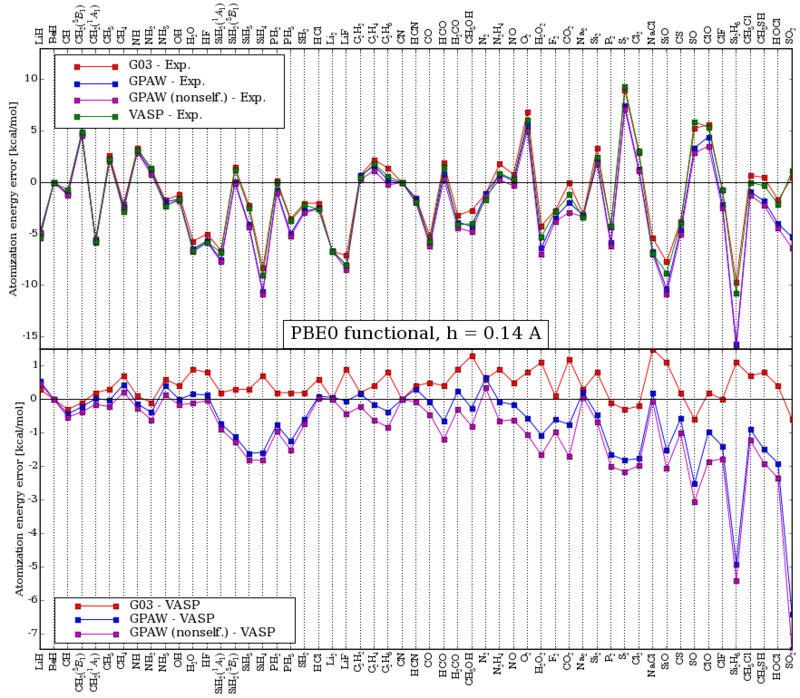 Inclusion of the non-local Fock operator as an exchange-correclation functional is an experimental feature in gpaw. Support for periodic systems. Actually, the code won’t complain, but the results have not been tested. Support for k-point sampling. No consideration has been made as to multiple k-points, or even comlplex wave functions, so this definitely won’t work. Forces. Force evaluations when including (a fraction of -) the fock operator in the xc-functional has been implemented, but has not been tested. Speed. Inclusion of Fock exchange is exceedingly slow. The bottleneck is solving the poisson integrals of the Fock operator, which is currently done using an iterative real-space solver with a zero initial guess for the potential at each SCF cycle. This should be optimized. Parallelization using domain decomposition is fully supported. The Fock operator can be used to do the hybrid functional PBE0, and of course, Hartree-Fock type EXX. These are accessed by setting the xc keyword to PBE0 or EXX respectively. Here “Global” denotes global hybrids, which use the same percentage of Hartree-Fock exchange for every point in space, while “RSF-SR” and “RSF-LR” denotes range-separated functionals which mix the fraction of Hartree-Fock and DFT exchange based on the spatial distance between two points, where for a “RSF-SR” the amount of Hartree-Fock exchange decrease with the distance and increase for a “RSF-LR”. See Range separated functionals (RSF) for more detailed information on RSF(-LR). A thesis on the implementation of EXX in the PAW framework, and the specifics of the GPAW project can be seen on the literature page. 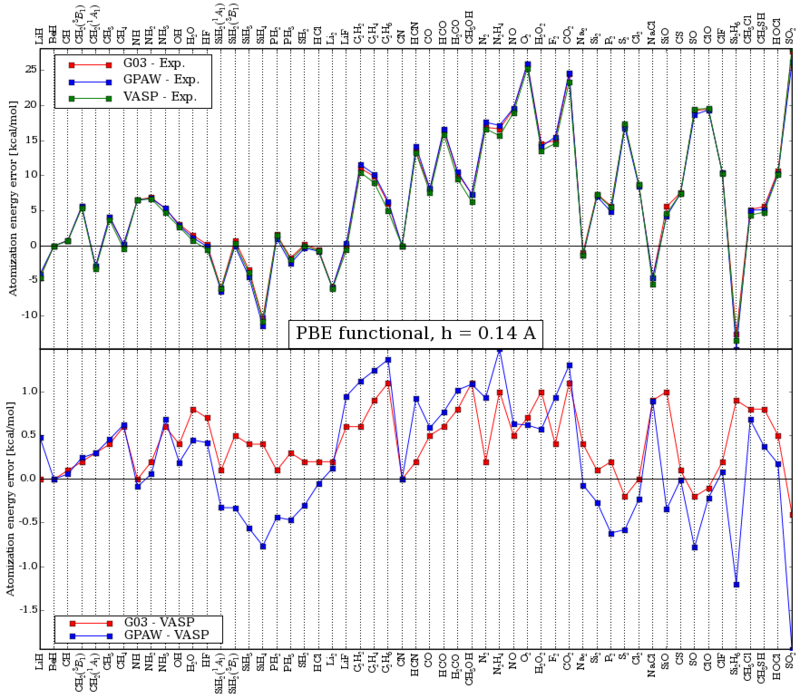 A comparison of the atomization energies of the g2-1 test-set calculated in VASP, Gaussian03, and GPAW is shown in the below two figures for the PBE and the PBE0 functional respectively. In the last figure, the curve marked GPAW (nonself.) is a non- selfconsistent PBE0 calculation using self-consistent PBE orbitals. """Calculate the excitation energy of NaCl by an RSF using IVOs.""" Support for IVOs in lrTDDFT is done along the work of Berman and Kaldor [BK79]. """Test calculation for unoccupied states using IVOs.""" [AB98] C. Adamo and V. Barone. Toward Chemical Accuracy in the Computation of NMR Shieldings: The PBE0 Model.. Chem. Phys. Lett. 298.1 (11. Dec. 1998), S. 113–119. [Ba94] V. Barone. Inclusion of Hartree–Fock exchange in density functional methods. Hyperfine structure of second row atoms and hydrides. Jour. Chem. Phys. 101.8 (1994), S. 6834–6838. [BK79] M. Berman and U. Kaldor. Fast calculation of excited-state potentials for rare-gas diatomic molecules: Ne2 and Ar2. Chem. Phys. 43.3 (1979), S. 375–383. [HA71] S. Huzinaga and C. Arnau. Virtual Orbitals in Hartree–Fock Theory. II. Jour. Chem. Phys. 54.5 (1. Ma. 1971), S. 1948–1951.